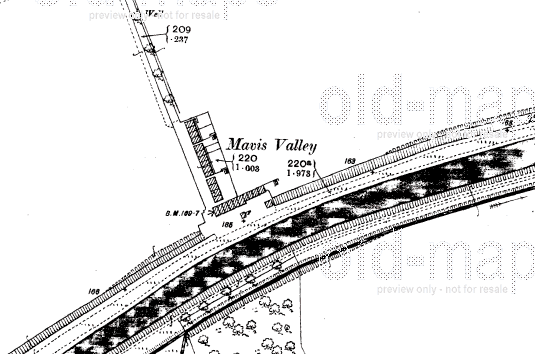 I first came across the story of the lost village of Mavis Valley whilst surfing around the web. It intrigued me but I gave it no more thought until recently (18 July 2010) when I decided to hop on my new bike and cycle off along the Forth and Clyde canal to see if I could find it. Here's what I learned about it from my web surfing and visit. Most of the information below comes from the web. Quite a bit of information comes from web forums which I regard as a fairly reliable source of information. I can say this because in many cases I was able to cross-check information, e.g. a first hand recollection of the building materials used in Mavis Valley houses can be verified against photographs and the Medical Officer's miners' housing report of 1910. Where I couldn't corroborate a fact I'm careful to qualify it with words such as "perhaps" or "probably" or "likely". This map shows the route along the canal that I took to get to Mavis Valley. It is located in the north-east of the map (top right) where you'll see a few photos that I took. There's not much left of the village now but there's just enough to give you an eerie feeling as you walk down the main street, whose rough cobbles are still visible through the narrow path. As I followed the path northwards I could see small remnants of brick buildings to my left and a large, shallow broad ditch to my right. My imagination ran riot. Children ran across the cobbles, babies cried, women laboured in the wash houses out back and men trudged home with blackened faces. This was home to generations of "poor but happy" people, but of course I'm conscious that the sentiment of memory can displace the reality of poverty. The web sustains many echoes of the past - Mavis Valley only has a past now - and many people remember this overgrown and wooded patch of the earth with much affection. The original houses date to 1855 which makes Mavis Valley more than six decades younger than the Forth and Clyde canal which passes its southern end. The village's location was probably chosen because of the proximity to local coal and ironstone pits owned by the Carron Company, known as pits 15 and 17 or the Cadder pits. Pit 17 was 500m west of Mavis Valley and is now the site of a recycling centre. Pit 15 was another 500m west of that and the site was subsequently occupied by the Centurion brickworks and now (2010) Whiteinch Demolition. Another factor in the village's location may have been that a water well was sunk a little uphill to the north (this is visible in some maps). It seems likely that the village got its name from the local prevalence of the song thrush known colloquially as a "Mavis". Why "valley" was used rather than glen is unknown to me, but it could be because there was already a place called Glenmavis. This OS map surveyed in 1858 is probably one of the first to show the village, which is roughly L-shaped. 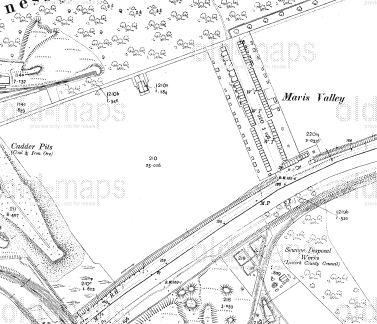 The ironstone pit to the west of the village is identified as Carron pit number 2 on a 1912 map which predates the more famous pit 17 which was about 200 metres to the north. To the north of the village is the Wilderness Plantation which survives to this day. I was tempted to call this section "The Village's Heyday" but I'm not sure it ever really had one. This map from 1897 (which can be purchased from www.old-maps.co.uk) shows that the village hardly changed in its first 50 or so years. Notice the well marked to the north of the village. The map below dates from 1912 (and can also be purchased from www.old-maps.co.uk) and shows the extension to the main street and marks the position of the houses, outbuildings and four water standpipes (there is one "WT" in illegibly small letters at the southern end of the village). The new houses were built to form a second row with the existing houses and extended in both rows all the way northwards to the Wilderness Plantation. Some of these houses were built in 1905. The housing report referred to below suggests that they were built at different times which is consistent with there being 89 2 apartment houses by 1901. The dates of the maps and the housing report allow us to be sure they were built before 1910 but after 1897. Notice also the railway has reached the area, though it doesn't quite come to Mavis valley. 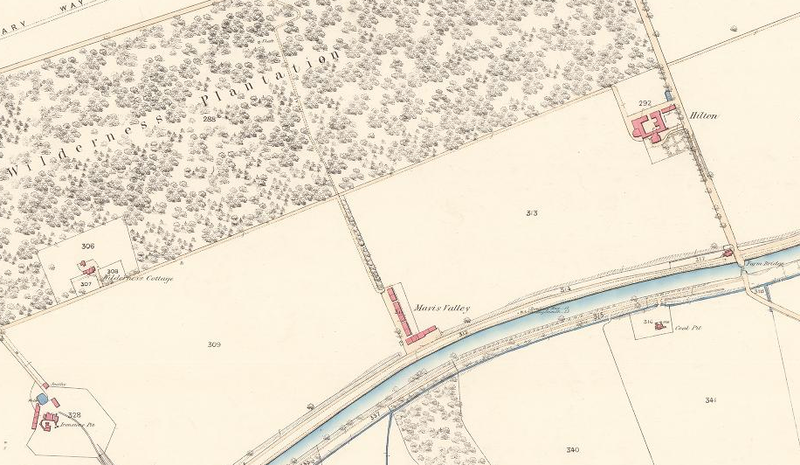 The railway leaves the main Edinburgh-Glasgow line in Bishopbriggs, passes Mavis Valley on the opposite bank of the canal and then swings southwards and off the map into a broad curves so it can cross the canal at a swing bridge (just off the lower left corner of the map). The remnants of the swing bridge can still be seen. A very interesting account of the living conditions can be found in this extract from "The Housing Condition of Miners" Report by the Medical Officer of Health, Dr John T. Wilson, 1910. It gives a favourable account of living conditions making them sound basic rather than squalid and notes only one case of overcrowding in one of the 24 "old houses". There were another 92 "new houses" making a total of 116. The old houses lacked internal running water, wash houses and coal cellars which is presumably why the new houses commanded double the rent. Curiously an account from a man who grew up in Mavis Valley in the 1940s states that none of the houses had internal plumbing. Apparently all houses were "Scavenged regularly at owners' expense". The report notes that there was no sewerage but that the waste was disposed of on Jellyhill farm, which is noted in the southeast corner of the 1912 map. The report also contains some plans and elevations of the two-storey new houses. This photograph from the early 20th century (copyright is unclear, but I think it belongs with East Dunbartonshire council) shows the village from the south, looking towards the Wilderness plantation to the north. It looks reasonably busy with a dozen or more folk on the street. The old houses made of cut stone (probably standstone) are in the foreground on the right of the picture and the newer red brick houses are across the road and in the distance (beyond the kink in the rows evident in the map). It seems that at least some of the older stone houses were demolished by the 1940s. 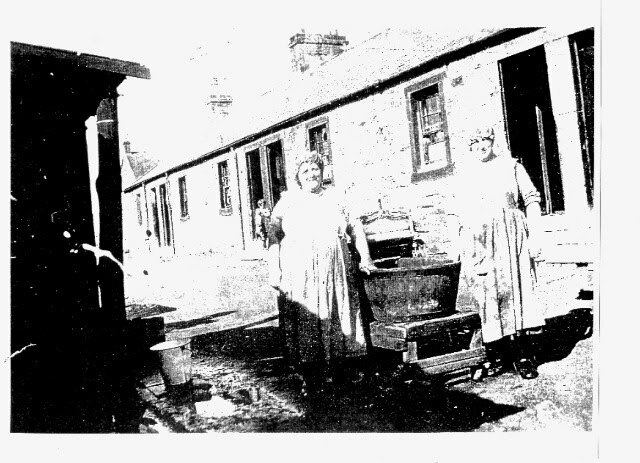 This photograph shows two women on wash day (original copyright unknown) in the 1920s or 1930s, presumably standing at the back of the houses by a wash house. On the 1st December 1937 it is said that Mavis Valley received HRH the Duke of Kent (Prince George, the fourth son of King George V) at its Community Service Club, which was probably housed in one of the older buildings near the canal. It would be interesting to find out what brought a senior member of the royal family to such an out of the way location but unfortunately I can find no other mention of this visit nor of him visiting Scotland in late 1937. In the evening of Sunday the 3rd of August 1913 a fire broke out at the number 15 Cadder pit. Of the 26 miners working that night only 4 emerged alive. All 6 men on shift who were residents of Mavis valley died. For such a small community this must have been a terrible shock. The disaster was widely reported and even got a short paragraph in the New York Times. A more complete account was given by the Kirkintilloch Herald, the local the paper. The various accounts of the disaster give a unique insight into the life of the miners and the nature of the mine itself, especially the official report on the disaster. One unusual name that features in the list of the dead is Owen McAloon from Lambhill. 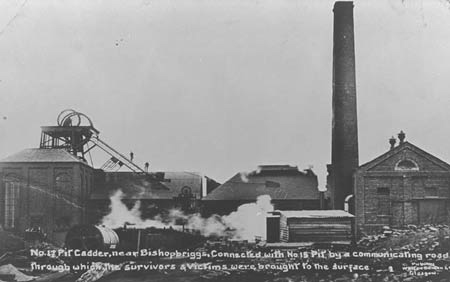 It seems that the family were particularly unlucky in that two brothers were later killed within weeks of each other in unrelated mining accidents at other pits. I couldn't find a photo of pit 15, but the photo below taken in 1913 (copyright East Dunbartonshire council) shows the surface buildings at pit 17 where iron stone was roasted after being brought to the surface. Pits 15 and 17 were connected underground allowing three of the survivors to escape. The Mitchell Library collection has another undated photograph of these surface buildings viewed from the other side, i.e. looking to the north and east, towards the Wilderness Plantation trees that are visible in the background. The building with the tall arched windows (on the left in the above photograph) is seen to the right on the one below. The Cadder pits are still present in the 1918 list of active mines but are absent in 1923 and all future lists. It seems likely there was an attempt to reopen the mine after the disaster but other references confirm that the mine was out of use by the early1920s. A map of 1922 depicts the site as looking complete, but a map of 1933 shows that most of the buildings have been removed and the railways are marked as "disused" with kennels marked at the western edge of the site (currently the site of Avalon Kennels). An aerial photograph from March 1950 shows the Cadder pit area and the edge of Mavis valley. Some of the mine working layout was still evident at that time, including the line of the railway that entered the site from the south. My older brother Neil lived in the Mavis Valley area from his birth in 1938 until the family moved to Auchinairn in December 1947. I asked him his recollection of the place, the envoirmnment [sic] and the people and this is what her wrote. Hopefully some of you will recognize some features of which he has written.
" Here is a run down on Mavis Valley as I remember it & Woodside Terrace. Crossing the Forth & Clyde canal at Brash's bridge & turning left and walking along the canal bank you come to the bottom of Mavis Valley. At the top it stops at the woods. The Mavis Valley had two rows of red brick dwellings facing each other. The lower half consisted of single floor dwellings on each side & the top half consisted of two floor dwellings on each side. The two floor dwellings had seperate families living top & bottom. All the houses were connected to each other & if memory serves there was a break in the middle on each side or a close, a conveyance for getting to the backs of the dwellings. There was no indoor plumbing & the only source of fresh running water was from 4 or 5 taps located the length of the valley, down the middle. At the bottom, near the canal was the Cowlairs Cooperative store & I can remember the managers name was Jimmy Keelan ( Right spelling?) Across from the "Co" there were old foundations of earlier buildings & these foundations were all cut stones. Along with my older brother & sisters we delivered Sunday papers in the "Vaillie" as we called it & we worked for the Patricks who lived in there. Other names that come to mind who lived there were the Browns (Broons) Thompson, Barr, Reid, Carrigan, Mc Callum, Mc Kinstry, McCann, Connolly, Lawlors, Lauder, McLaren, Bulloch, Nesbit, McAloon, Cassidy, Lafferty & Rooney. The name Hutcheson rings a bell & a family named Hewitt or Hewitson who one of them was supposed to play for Partick Thistle.I don't know if this was true.As a rough guess there may have been upwards to 50 to 75 families living in the "Vaillie". At the top of the row was the woods & if you turned left & proceeded for about 5 mins you would come to Woodside Terrace locally known as "The Big Pit". I was born there. Surrounded by a "Bing",( from the old mine) farmers field & some more woods was a single red brick structure containing 12 dwellings 6 up 6 down seperated by 3 "closes" with entrance into 4 dwellings. The dwellings themselves contained 2 bedrooms, a bed recessed in a combined living room/ dining room with a grate that burned coal for heat & cooking. There was also a small kitchen which a small sink with a tap for cold water. A water closet was located outside in the close shared by 4 families. The names of the families I can remember who lived in the "Big Pit" were the Bonars, Foxes, Campbells, Kennedy's, Bowies, Armstrongs & Reids. Taking a path (the Cowper or Couper) towards the canal was a little cottage where the Walkers lived. The bing was right behind them & I can remember going to a spot at the base of the bing & gathering pieces of coal for the house when we had no coal to burn. Two things stick in my mind while living in the "Blg Pit" was when soldiers came to do some training in preparation for D Day & when the broke camp they gave us kids lots of goodies & as every thing was rationed, it was great stuff to get. The second event was the 2 bonfires celebrating the war's end. All the families went out of their way, considering the rationing to put an a feast & there was no shortage of wood for burning. My father & other men worked in the nearby mines, the "Wee Mine" near Balmore & before that the "Gulshie' near Blackhill out by Lambhill. Other men worked at the brickworks managed by Mr Mc Farlane. The "Big Pit" was demolished when???? I don't know & is now a Land fill site ( a Tip). So a lot of history is buried. Most, if not all of the families from the "Big Pit" & Mavis Valley moved to Auchinairn in 1947 & 1948. It was after that the Squatters moved into the houses in the "Vaillie". How long they stayed there I don't know but they were there in the early fifties as I was still delivering Sunday papers to them, then. Some of the original families from the "Big Pit" stayed there at least 7 to 8 years after we left in 1947. The Kennedy's for one. There you have it. That was the "Vaillie" & the "Big Pit " as I remember them." With the local pits closed, Mavis Valley residents found work in other mines and other industries in the area, but as the Glasgow area became less and less industrial through the 20th century and the canal became almost entirely disused and amenities such as running water and electricity became the norm, the village's future seemed bleak. This education committee report from 1948 by P.A. Grimely gives some idea of what befell Mavis Valley. The REME (Royal Electrical and Mechanical Engineers) pitch mentioned was north and east of the site and was associated with a WWII ammunition magazine. 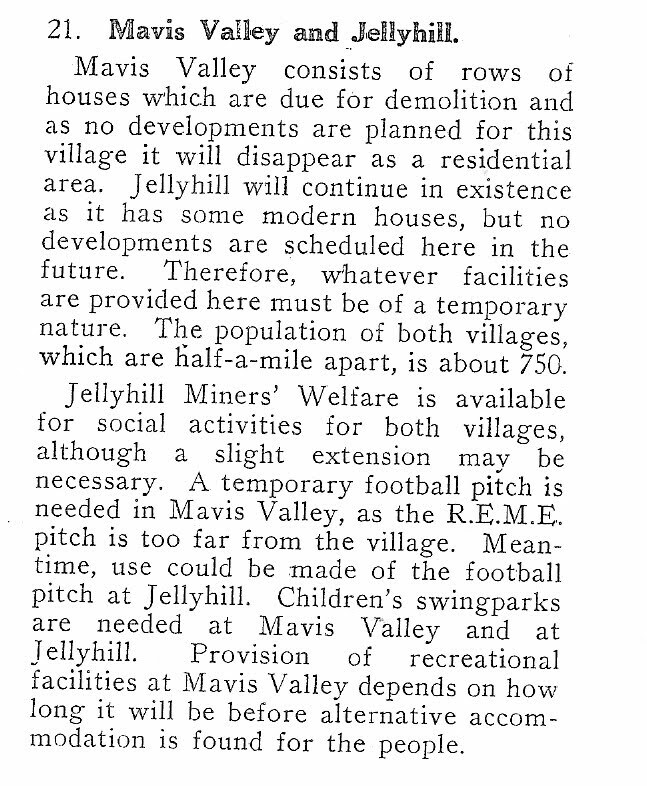 As it turned out, Jellyhill suffered a worse fate than Mavis Valley because all traces of it were erased to make way for a housing estate - even the name is now nearly forgotten. The only thing that remains today - visible in Google Earth - is the football pitch mentioned in the above article. It seems that a deliberate decision was taken to stop any investment in facilities at Mavis Valley and relocate the remaining residents to Auchinairn. The village persisted into the 1950s with a few families who presumably didn't want to leave what they considered to be their home .They were soon joined by squatters moving into vacated houses. By 1959 there only 24 houses left and the remaining houses were probably demolished during the 1960s. An OS map from 1980 shows the road but no houses, whereas a Glasgow Street atlas from the mid 1970s based on OS map information (no date is explictly given) still shows all houses being present. One of the things that makes Mavis Valley interesting is that despite its close proximity to a large city and its suburbs, the land was never built upon or reused. Contrast this with the fate of Jellyhill less than a mile away. The name Mavis Valley is still in use despite the village itself being long gone. It is used to describe the nearby recycling centre which is on the site of Cadder pit 17. It is also the name of construction company: "Mavis Valley Builders Ltd". And, perhaps most bizarrely of all, the number 88A bus route still goes to "Mavis Valley" and was referred to in a news item by First Buses in June 2009. The gravel was dumped here in the last year or so for maintaining the current towpath. The large concrete block is probably associated with water pipes passing under the canal as a substantial structure can be seen on the other side too. The rusting metal fitments suggests it is comparable in age with the creation of the Bishopbriggs housing state on the other side of the canal. If so, it was put in place after Mavis Valley disappeared and a good part of the main road along the line of the current footpath must have been dug up for the pipes. If this is the case then the stones seen on the footpath are probably not cobbles of the old main street, but rubble used to firm up the footpath. Urban Glasgow page about Mavis Valley - recent pictures are better than mine!